The Woodbrook Hunt Club has graciously invited the Washington Regency Society members and friends to join with them for a traditional Blessing of the Hounds ceremony, a formal full-scale HUNT, a Hunt Breakfast and a side saddle demonstration and picture opportunity on Saturday, November 3rd. This is a “once in a lifetime opportunity” for most of to experience the English tradition of fox hunting up close and in period attire. This is an all-day event beginning with arrival between 10 and 10:30 am at the Woodbrook Hunt Club site in Lakewood, Washington. Weather, horses and riders will determine if we can get some sides-addle demonstration and pictures taken prior to the 11 am traditional Blessing of the Hounds ceremony at 11 am. We are then invited to drive along a route (carpool is ideal) on Joint Base Lewis McChord watching as many as 50 or more riders following a pack of hounds as they leap over jumps, through fields and up trails. We’ll see the hounds lead the group of horses and riders at walks, trots, canters and full gallops while in their traditional formal hunting attire. We will learn a lot about the tradition of hunting foxes which prevails today and was current in regency times. No foxes or other live animals are being hunted or killed in this event. Our group will join with the rest of the Woodbrook Hunt Club for the traditional Hunt Breakfast at the Woodbrook Hunt Club House adjacent to Joint Base Lewis McChord located at 6206 150th St. SW, Lakewood WA 98439. The Hunt Breakfast will occur in the mid-afternoon, the time being dependent upon the return of the riders from the hunt. 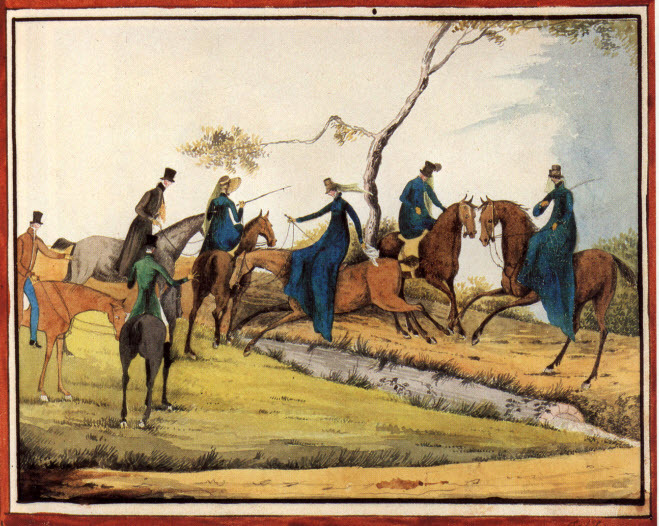 The Woodbrook Hunt Club members are very interested in seeing Regency attire, particularly historical riding attire. You may be informally asked about your riding habit or clothing, its period, etc. If you are still looking for ideas about what to wear take a look at our Pinterest boards for some ideas about riding attire. As with all Washington Regency Society events, however, costumes are admired but not required. Following the action of the hunt by car (there are usually several waves of hunters (possibly as many as 75) of varying abilities riding their horses (and a donkey) and following a pack of trained hounds with Master of the Foxhounds and Whipper-ins managing the hounds and the hunters. The amazing chance to learn a great deal about an English sporting tradition that sprang up in part due to the Enclosure Acts and the General Enclosure Act of 1801.